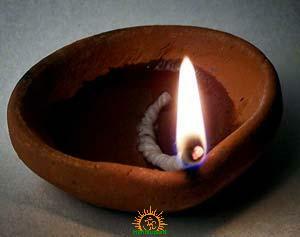 Ghee lamps and oil lamps have always been preferred during any important puja rituals in the Hindu tradition. Lighting the lamp is not just an act of lighting the surrounding. Lamps are lit even during day time when there is enough light available. There is a reason behind using lamps during puja. When we are worshipping the God either at home or in a temple, we are looking out for a spiritual experience which can give us positive energy and strength. For this reason it is important that the surrounding is calm and conducive in nature to facilitate the mood for the worship and enhance concentration for the devotee. This can be achieved only by traditional lamps and not by just lighting the place with an electric bulb. The oil or ghee we use in lighting the lamps connects us with the prithvi tatva because the source of this is derived from an aspect of the earth. The oil seeds are grown on earth and ghee is derived from cattle. Then the wick is also derived from this element. When this is burnt with the flame, the light connects us with the agni tatva. The fragrance that is derived from this connects us with the vayu tatwa. Also the light emitted connects us with the akasha tatwa. This way we will be more connected with these elements by using traditional lamps as against electric lightings. When traditional lamps are lit during puja, it eminates the right kind of positive energies to facilitate concentration and soothing of the mind. This enhances the spiritual experience and helps in creating the right environment for the puja.This cannot be done by merely switching on an electric bulb.